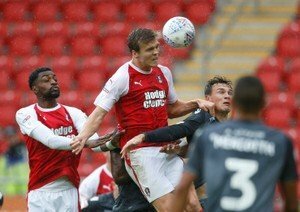 Rotherham United defender Sean Raggett was back in action this afternoon in a game that saw the Millers second string lose out in the The Central League Cup to neighbours Doncaster Rovers Reserves. Raggett, who limped off after less than twenty minutes away at Wigan at the beginning of September which ended up with him needing surgery on an ankle injury, got the Millers only goal in a three-one loss playing alongside a youthful reserve side. But, despite the defeat, it can only be good news that the Norwich loanee is back in match action and we all hope he’s soon fit enough to be included in the first team. The tall twenty-four year old joined the Millers in July on a season long loan, although there is a clause in the contract saying he can be recalled by Norwich in January, and has scored one goal in his five appearances.